The exhibition will take place at The Italian Cultural Institute of Los Angeles with support from the Hammer Museum, LAXART and ForYourArt. LOS ANGELES, CA, March 15, 2011 – DEPART Foundation and Provincia di Roma present When in Rome, a group show in Los Angeles that will exhibit some of the most interesting artists associated with the city of Rome and its environs. Through painting, installation, conceptual art, pop culture, performance, cinema and music, the project aims to read the works in their own individuality and in a strongly suggestive display. The works will, in fact, be exhibited within a stage, a real-life environment. Created and supported by DEPART Foundation and Provincia di Roma, When in Rome follows the highly anticipated and successful original concept of bringing the New York art community to Italy with New York Minute in September 2009. On Wednesday, April 20th, When in Rome will open with an evening of programming to highlight the notion of bringing some of Rome’s most exciting artists to Los Angeles starting with a traveling performance at the Hammer Museum, followed by the opening of the exhibition at the Italian Cultural Institute and ending the evening at the Mandrake, the resident bar frequented by the art and culture patrons of LA. Luigi Ontani, one of the most influential and remarkable Italian artists working today will kick off the evening with his performance titled, AmenHammerAmeno at the Hammer Museum, the Italian Cultural Institute’s neighbor. The performance will begin in front of the museum and consist of a traveling parade made up of 13 performers and 3 musicians as they weave their way through the streets of the Westwood Village, past the Italian Cultural Institute and end with a tableau vivant in the Hammer’s courtyard. The guests will then make their way to the Italian Cultural Institute for the opening of the exhibition, which will run throughout the month. The evening will continue at the Mandrake, the art centric bar in Culver City where everyone will be able to view artist Rä Di Martino’s billboard project next to LAXART on La Cienega Blvd. The exhibit is curated by Luca La Pinto in collaboration with Valerio Mannucci and presents the work of a new generation of artists who—although distributed across different age groups—animate the artistic life of Rome and its environs today. To widen the cultural frame of reference, the exhibit also presents works by some artists from preceding generations. Historic artists such as Alighiero Boetti, Gino De Dominicis, Francesco Lo Savio, Fabio Mauri, Luigi Ontani and Emilio Prini constitute an essential key to reading the exhibit, producing a second interpretive level. Integral to the show is a series of screenings in film, video and documentary form that directly describe the city of Rome and its environs or deepen the dialogue of some of the artists presented in the show. Conceived as an integral part of the exhibit, the program is not to be thought of as an appendix only; in fact, it describes a missing element, the ensemble of cultural and aesthetic influences that form the frame and background of current artistic practice. Provincia di Roma [District of Rome], with more than four million inhabitants, is the most populous in Italy and manages the services and infrastructure of 121 communities (including Rome) within a vast area of five square kilometers. Creativity is very important for Rome and its metropolitan area. There are 70,000 creative businesses and over 230,000 employees who contribute significantly to the growth and development of the district; beyond this economic dimension lies a contribution to cultural growth. The project “Provincia Creativa” was launched to recognize the value of these businesses, with the goal of strengthening Rome’s creative community, facilitating innovation, establishing ties with other national and European entities, promoting ideas formed in educational settings and sustaining the globalization of the sector by expanding the possibility of specialization abroad for the talented. DEPART Foundation is an arts organization dedicated to the development and support of contemporary artists whose work and careers distinguish themselves from previous endeavors or predecessors. DEPART Foundation actively supports the fields of research, artistic production, education, and acquisition, encouraging the growth of these artists through the promotion of a residency program, laboratories, symposia and grants for research; it plays an active role in the field of urban development through architectural planning and design and cultural development through programs and initiatives aimed at the community. The Italian Cultural Institute of Los Angeles, founded in 1984 and located in Westwood at 1023 Hilgard Avenue, is one of the five governmental cultural agencies established in the United States by the Italian Ministry of Foreign Affairs to promote Italian culture. It has a library of over 5000 books available for loan, an art gallery and a theater suitable for conferences, concerts and movie screenings. The IIC organizes Italian language classes and supports grants for the translation and the publication of Italian books in English. Events are organized in partnerships with many local institutions to introduce Italy in all its cultural complexity to the American public. The Hammer Museum, a public arts unit of the University of California, Los Angeles, is dedicated to exploring the diversity of artistic expression through the ages. Its collections, exhibitions, and programs span the classic to the cutting-edge in art, architecture, and design, recognizing that artists play a crucial role in all aspects of culture and society. The museum houses the Armand Hammer Collection of Old Master, Impressionist, and Post-Impressionist paintings and the Armand Hammer Daumier and Contemporaries Collection. The Hammer’s newest collection, the Hammer Contemporary Collection, is highlighted by works on paper, particularly drawings and photographs from Southern California. The museum also houses the Grunwald Center for the Graphic Arts, comprising more than 45,000 prints, drawings, photographs, and artists’ books from the Renaissance to the present; and oversees the management of the Franklin D. Murphy Sculpture Garden on the UCLA campus. The Hammer presents major single-artist and thematic exhibitions of historical and contemporary art. It also presents approximately ten Hammer Projects exhibitions each year, providing international and local artists with a laboratory-like environment to create new work or to present existing work in a new context. As a cultural center, the Hammer offers a diverse range of free public programs throughout the year, including lectures, readings, symposia, film screenings, and music performances. The Hammer’s Billy Wilder Theater houses these widely acclaimed public programs and is the new home of the UCLA Film & Television Archive’s renowned cinematheque. Celebrating its 5th Anniversary in 2010, LAXART is the leading independent nonprofit contemporary art space in Los Angeles, committed to the production of experimental exhibitions and public art initiatives. Responding to Los Angeles' cultural climate, LAXART produces and presents new work for all audiences and offers the public access to the next generation of artists and curators. LAXART supports challenging work, reflecting the diversity of the city and stimulates conversations on contemporary art in Los Angeles, fostering dynamic relationships between art, artists and their audiences. LAXART has produced and commissioned over 100 projects in five years. ForYourArt is a platform best known for its hybrid model of promoting local projects, publishing art-focused media content and elevating cultural philanthropy. When in Rome presents in Los Angeles, together for the first time, the works of some of the most interesting artists associated with the city of Rome and its environs. The show is structured in three levels: an exhibition component at the IIC, a special project at the Hammer Museum and a site-specific collaboration with LA> The title originates from the appropriation of the English-language proverb “when in rome, do as the romans do”, a universal formula which highlights the necessity to adapt to local customs when one finds oneself in a geographic, social or cultural context different from one’s own. The main purpose of the exhibition is, in fact, to present works of art and artists from Rome in a city like Los Angeles, keeping in mind not so much the specific or typical peculiarities of this city as much as the cultural and aesthetic prerogatives that make up the background for the reception and fruition of the show itself. The common risk for shows of this kind is that of wanting to define, almost always with no real basis, a more or less evident local and cultural quality that connects the artists, artworks and geographical context. When in Rome aims, instead, to reflect on the individuals and the artworks themselves. The participating artists represent a new generation that, although distributed across different age groups, animates the artistic life of Rome and its environs today. Different experiences, therefore, that still take place against a shared background. In occasion of the exhibition, Luigi Ontani—one of the most influential and remarkable Italian artists working today—will conceive of a new performance titled AmenHammerAmeno in collaboration with the Hammer Museum. The performance consists of a procession/parade that will end with a tableau vivant and formed by 13 performers led by Ontani himself accompanied by three musicians. Each performer will wear a Balinese mask created by the artist who will be the only one without one. Luigi Ontani is often the subject of his own work, wearing the clothing of mythical figures from history, religion or literature, drawing from very diverse sources, both near and distant in time. Ontani’s idiosyncratic work represents a radical counterposition to that adopted by Arte Povera in the years he came to prominence. His photographs, drawings, installations, performances and tableaux vivants relate to an extremely rich western and eastern iconographical tradition. The collaborative project with LAXART, the most active non-profit organization in Los Angeles, is inserted into the context of site-specific projects the group has been carrying out for years. One of the exhibited artists will present a work conceived specifically for an advertisement billboard near LAXART’s headquarters. On the curatorial level, there is a tendency in these cases to use the works, through their similarity of style, aesthetic and content, to create and define common cultural ground.When in Rome, however, aims to read these works in their own individuality within a strongly suggestive display. In the spaces of the IIC, the works will, in fact, be displayed inside a stage, the locations transformed into proper environments inspired by reality or collective imagination. This choice is also tied to the show’s host environment, Los Angeles, a mix of reality and fiction, artifact and original, a continuum on which it is difficult to identify the beginning of one thing and the end of another. From this perspective, the idea is to present these different works in an environment which produces an imaginary context, one made of nuances capable of emphasizing and recontextualizing the works themselves, expanding their boundaries. Presenting works that span painting, installation, conceptual art, pop culture, performance, cinema and music, the exhibit wants to make evident the fact that the scene that revolves around Rome is not univocal and coherent. The strong economic disarticulation and substantial cultural immobility of the last decades have made the city into a harsh but stimulating region made up of layers, where the old stays old and the new is never new. Extremely different experiences overlap but do not seek out or define tradition, even as they take part in it. 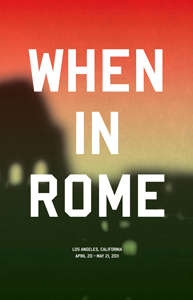 When in Rome brings together a significant set of these artistic expressions in an attempt to render explicit and intelligible—even to an international public—this complex cultural dialogue. To enlarge the cultural frame of reference, the exhibit also presents, inside the show itself, the work of some artists from preceding generations. Historic artists such as Alighiero Boetti, Gino De Dominicis, Francesco Lo Savio, Fabio Mauri, Luigi Ontani and Emilio Prini constitute an essential key to reading the exhibit, producing a second interpretive level, almost to function as a tool to better understand the current generation’s work. These artists are in some ways obligatory points of reference; in any case, their examples define an artistic and human attitude that has significantly marked the culture in which the new generation of artists works. In addition to the exhibition project, there will be an accompanying series of related events aimed at enhancing and augmenting the contents of the show. In the IIC’s auditorium a series of film and documentary screenings will be organized to function as a further instrument for reading the works in the exhibit. On occasion of the opening, some of the participating artists will present a series of performances conceived ad hoc.